In the above hadeeth, Rasulullah (sallallahu ‘alaihi wasallam) has encouraged us to not make our homes into graveyards. A graveyard is a place that is inhabited by dead people. Similarly, when a person does not have the ‘ibaadah of Allah Ta‘ala in his life, such as zikr, salaah, reciting the Quraan Majeed, making ta’leem, etc., then he is like a dead person, and his home will similarly be like a graveyard – devoid of joy and happiness and inhabited by Shaitaan. Rasulullah (sallallahu ‘alaihi wasallam) thereafter explained that in order to enliven and illuminate the home, we should recite the Quraan Majeed – especially Surah Baqarah in specific, as the recitation of this surah causes Shaitaan to flee the home. 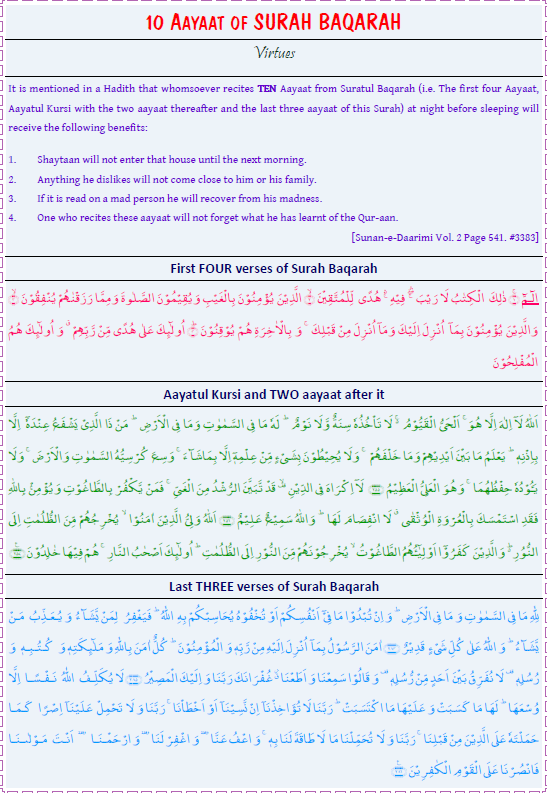 In another hadeeth, Rasulullah (sallallahu ‘alaihi wasallam) mentioned that holding firmly to the recitation of Surah Baqarah is a means of barakah, leaving it out is a means of regret and sorrow, and it is such a Powerful Surah that people who cast spells of black magic cannot endure it (i.e. it is effective in repelling their black magic). (Saheeh Muslim #1874). Since this prescription has been given to us by Rasulullah (sallallahu ‘alaihi wasallam) directly, we should have complete conviction in its effectiveness and hold firmly to it as well. May Allah Ta‘ala illuminate all our homes and make them a source of peace and prosperity, aameen.